This scarab was found together with a second deep within the long tubular flower of Sacred Datura -- Datura wrightii. Identification to species was made by Bill Warner. The large white grubs of various scarab beetle species are familiar to gardeners as they dig and cultivate their soil. C-shaped and plump-looking, they feed under ground or in rotting logs, composting vegetation, and in this case the roots of living plants. Many species are rather specific to certain kinds of habitats and composted materials. 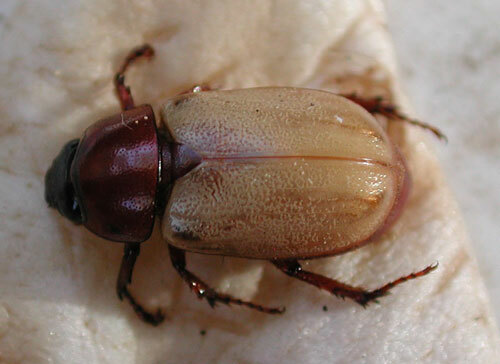 The Masked Chafer is recorded as a pest of sunflowers in Brazil by Moscardi and Corso (1988, Empresa Brasileira de Pesquisa Agropecuaria, Londrina, PR (Brazil). As adults, scarabs feed on a variety of plant tissues with fruit and flowers a favorite. Sometimes feeding is on plain leaves. In the Sonoran Desert this species can be found on flowers mostly in riparian areas where vegetation and flowers are more abundant. At night many species fly towards artificial lights.